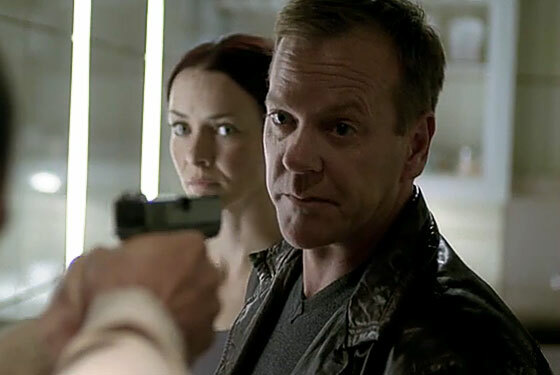 24 Recap: The Absurd-o-Meter is Back! This is the most hormonal bunch of agents we’ve seen in awhile. Arlo’s sweating Dana. Dana’s developing a soft spot for her ex-con ex-boyfriend. Cole’s handing out ultimatums to win Dana back. Director Hastings is making eyes at the stooge from Justice. Chloe’s worried about her buddy Jack. Jack’s coddling Renee. And Renee, well, she’s just trying keep her death wish in check before she gets a chance to make out in the interrogation room with Jack. It’ll be a miracle if anyone can stay focused long enough to stop the Nuke From Forest Hills. Oh there you are, Absurd-o-Meter — just when we needed you most! 4. Hastings Brand Perma-Foil™. If viewers argue that Jack’s become more of a plot device than a character, then the same can be said of Director Hastings. He’s so insubstantial that the writers feel free to use him as an all-purpose foil to (meekly) protest whatever’s coming out of someone else’s mouth, which gives his scene partner a chance to steal the show. This week, Hastings chastised Weiss for trying to set up Renee Walker for a fall (letting Weiss reveal his evil underbelly), but defended the same decision to Jack (sending Bauer up to the moral high ground). Maybe the show is trying to make a point about how management is an endless series of compromises — one moment you’re halfheartedly espousing the ideals that got you there, the next you’re a mouthpiece for the C-suite — but somehow we think not. 3. Lady spies can be a real liability. There’s been a lot of talk about whether Renee Walker could replace Jack and take over the franchise. So far, this season seems to be one long “Yeah, right.” Sure, she stabbed Vladimir Laitanan “fifteen times” (uh, it was about ten times less than that by our count) with his own bread knife, and the debriefing is just an excuse to scapegoat an unstable agent. But hearing the accusations leveled against Walker — “evidence of a sustained and furious assault with a clear intent to kill” and a file that showed “this isn’t the first time you’ve lost control” — we couldn’t help but think of Jack, especially when he knocked out the debriefing-room guard and strangled the Justice rep to break Renee out. In all earnestness, aside from the suicidal ideations, which one could argue they both share, what makes Jack an asset and Renee a liability? Half the time he was telling her to abandon the mission with Laitanan, it felt like it was because he wanted to step in and put his life on the line instead. 1. The whole point of a bomb is to blow things up, right? Um, no. Not when that bomb is nuclear and you were using it as a political bargaining chip to establish control of the Middle East and leverage with the U.S. But no matter, when the single-minded (America=enemy) IRK operatives discover that transporting the fuel rods out of the country won’t be that easy (it’s only weapons-grade uranium, why would they have a contingency plan? ), they decide to slap on some explosives and a detonator and nuke New York instead. Of course, later it turns out that Farhad Hassan, the president’s brother, can’t go through with it. We can’t say we’re surprised. The Wes Anderson suiting, the Jason Schwartzman–esque grooming — he was obviously better suited for an existential crisis than a terrorist one.